Come to the Swallow Tail Jig party! Some of us were chatting in the chat box (appropriately enough) the other night about the Swallow Tail Jig and how popular it is. @RosinedUp suggested that it might be fun to start a thread for folks to post their own renditions of STJ, much like the It's a Long Way to Tipperary and the St. Patty's Day party threads. So, I'll get the party started. Mine is a micro group project: just me on the fiddle and myself on the guitar. OK, rosin up your bow, switch on your video camera or audio recorder and join in the party! You are a PARTY GIRL!!!! >>> ROCKs!!! > I might just have to come to this party. > I'm going on 6 months and I think it is time to PARTY!!! @ KindaScratchy > that was SWEET!!! > I'm a gonna work on that. Glad you liked it @StoneDog ! You definitely have to come to the party! Some folks in the chat asked for the click track that I made for myself, so here it is. Posting the sheet music that I used, too. They also asked for my guitar part as a backing track. I'll post that tomorrow. It's not a group project, per se, but I hope these are helpful nonetheless. BTW, the click track starts with four measures of click to allow enough time to get ready to play. EDIT: I just realized that the .wav file is 11mb, which might cause problems for some folks. I'll post an mp3 tomorrow. WOW, this is beautiful, Diane. 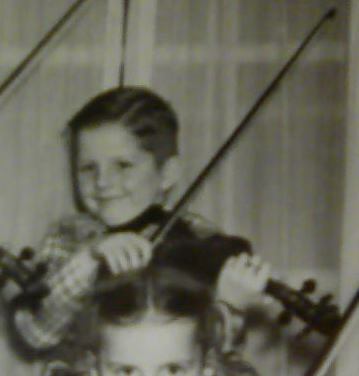 Awesome, you did an excellent job, both on violin and guitar playing. Come to this party, StoneDog. I would love to hear your playing. cause its just plain fun! @ KindaScratchy Very nice job, Diane. I love the video mixing. @ Robert (picklefish) I think you need to work on your posture, hold your violin up. You are using your shoulder / upper arm and not your elbow and wrist, your bowing look's very stiff. Thanks for the nice comments, Ratvn, Ken and Suresh! And thanks for coming to the party, Rob! Great job. I do the same thing when I'm practicing STJ that you did in your video: I repeat it several times, playing faster each time to see how fast I can go. Forgot to mention that folks are welcome to recycle previously posted STJ videos. No need to record from scratch, unless you want to. Oh, and here's the click track in .mp3 format. This file is only 1 mb (unlike the 11 mb .wav file). The click track includes a .midi-like version of the melody, so it serves the same purpose as a backing track, more or less (for example, helps with intonation). If I needed a critique I wouldve located the vid somewhere else, I thought this was a party? Just a couple suggestion's, Rob, I forgot, you are a teacher and I would have said the same thing if we were partying together. If that came accross as serious I appologize, I meant it more in the "relax its a party vein" and not the "dont criticize me" way. I was in alot of pain and just threw it on there. My back has really been killing me lately and I was propping myself up on my left elbow. lol. no worries just havin fun! Hi Pfish! I enjoyed it. Thanks. Here's just the guitar part, in case anyone wants to use it as a backing track. Sorry, there are no intro measures. It just starts right in at the same time as the fiddle. You play well KS > I was out in the yard this evening. I saw a Humming Bird > you play the guitar well. SWEET!!! @KindaScratchy ..you rock.. impressed.. impressed.. what a great job. I am sooooo motivated to work on this next week when I get a few things off my plate..
Great party...I am raising my glass (seriously I am..) Great tunes..
That was awesome, guys! Love both videos! Thank You kindly for posting it! You have a good eye for guitars, @StoneDog. As you noticed, I've got an Epiphone Hummingbird. Mr. Scratchy gave it to me for Christmas a few years ago because I love to watch hummingbirds that visit our yard in the summer.